A streak of red, sharp against the winter sky, darts across a meadow and comes to rest on top of a snow bank. "In richness of plumage, elegance of motion and strength of song, this species surpasses all its kindred in the United States," declared Audubon. 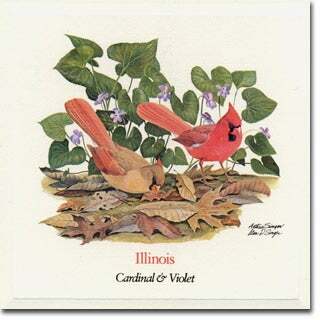 Seven states--Illinois, Indiana, Kentucky, North Carolina, Ohio, Virginia, and West Virginia--agree with Audubon, as all have chosen this prince as their official state bird. Commonly known in the Midwest as the Birdsfoot Violet, Viola pedata is easily distinguishable from other Violet species because its leaves are cleft into segments resembling a bird's foot. English literature is full of references to this Violet, where the poets often use it in reference to the gentler qualities of life. Elizabeth Barrett Browning wrote exquisitely of the Violet: "Deep violets, you liken to the kindest eyes that look on you without a thought disloyal." Shakespeare's Violets are the flowers of vanishing youth; perhaps he means us to read in the Violet a message to seize life before it is gone. 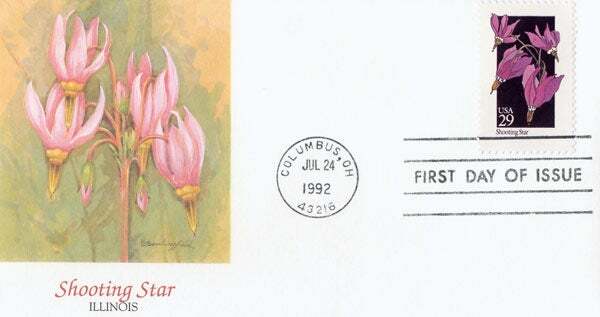 Illinois Wildflower - Shooting Star Art from the 50-stamp series, State Birds and Flowers, issued April 14, 1982 simultaneously in all state capitals.